The Pacific Beach Hotel is the perfect place to treat the family to two Island traditions – the Aloha Festivals Floral Parade and the famous Breakfast Buffet at the Oceanarium Restaurant, in the same location right on Kalakaua Avenue with guaranteed parking at the hotel. Drive to the Pacific Beach Hotel, park at the hotel and take the family to the Breakfast Buffet that begins at 6:00 a.m. and continues until 10:00 a.m. After enjoying both the Japanese and traditional buffet offerings, just walk to the front of the hotel and enjoy the 65th Annual Aloha Festivals Floral Parade. You will have plenty of time since the parade begins at 9:00 a.m. at Ala Moana Beach Park and won’t begin to pass the Pacific Beach Hotel until almost 10:00 a.m. so you can enjoy a relaxing breakfast buffet and the hundreds of fish and marine life in the spectacular three-story Oceanarium before taking in the marching bands, pau riders, floats and hula halau. If the early morning hours don’t suit you, come to the hotel to watch the parade and stay for the Saturday Oceanarium Brunch Buffet that features prime rib, a seafood bar as well as the breakfast offerings. The Brunch Buffet begins at 11:00 a.m. on Saturday. After enjoying the parade and buffet, you’re just a few steps away from your car and with the buffet parking validation, the cost is only $3.00. The Pacific Beach Hotel is located on the corner of Kalakaua Avenue and Liliuokalani along the heart of the parade route across Waikiki Beach. 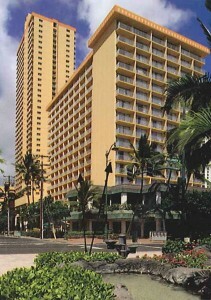 To make buffet reservations, call 921-6111 or visit www.pacificbeachhotel.com.